Last Friday saw the culmination of six months of meticulous planning by the Constructing Excellence Yorkshire and Humber team based at Leeds Beckett University to bring you this year’s #CEYH2017 awards and what an incredible night it was! 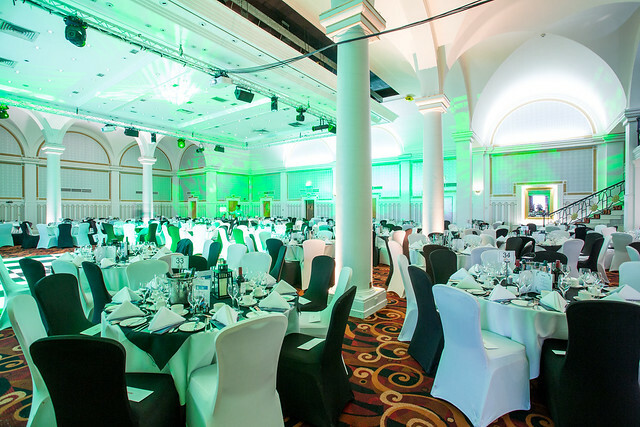 Held at the Queen’s Hotel in central Leeds, we welcomed over 350 of the region’s construction and property professionals to our 10th Anniversary celebration of the best examples of industry achievement in the last twelve months. Sponsored by Galliford Try and once again hosted by Danni Hewson, BBC Look North’s business correspondent and industry champion, attendees were treated to networking drinks and a three course summer themed meal, set against our spectacular Yorkshire and Humber AV backdrop of Burnsall Village. We also welcomed Rosie Millard, Chair of Hull City of Culture as our keynote speaker for the evening who gave a captivating presentation on everything Hull has been up to this year so far and a taster of what is still to come. Rosie’s speech definitely went down a storm with our Humber contingent who are rightly proud of their home city! Continuing the Yorkshire theme was our awards playlist featuring only bands from the region; Def Leppard, the Cult and Chumbawumba to name a few; and our Yorkshire coast themed fun photobooth where attendees posed with hats, ice creams and even an inflatable seagull against a picture of Scarborough. However the real regional stars were the outstanding projects, schemes and organisations who made up the CEYH2017 finalists. Fourteen awards were handed out in total covering the key best practice themes of Constructing Excellence as well as the much coveted and fiercely contested “Selfie of the night”. A special Chair’s award was also handed out posthumously to Dr Andrew Platten, former Associate Dean of Arts, Environment and Technology at Leeds Beckett University who was tragically killed in a cycling incident last July. In honour of Andrew, this year’s chosen charity was Brake and the team were thrilled to raise over £2500 through donations and raffle entries. Many thanks to Keelham Farm Shop, Queen’s Hotel, Snap Recipe Box and East 59th for their generous prize donations. However the real winner on the evening was the industry itself. The sheer diversity of projects from local regeneration schemes to multi-million facilities demonstrates once again that the Yorkshire and Humber region is at the forefront of pushing boundaries, driving up standards and finding new ways to work collaboratively to achieve mutual cross sector benefit. So all we have left to do is extend a huge THANK YOU to all our sponsors, supporters, entrants, judges and participants. We look forward to seeing you again in 2018! If you are interested in being involved in #CEYH2018 (sponsoring, entering or assisting) please contact Liz or Donna on 0113 812 1902 or via email to ckeevents@leedsbeckett.ac.uk. We look forward to hearing from you!